Kwun-ya is the word for paan in Myanmar, formerly Burma, where the most common configuration for chewing is a betel vine leaf (Piper betel), areca nut (from Areca catechu), slaked lime (calcium hydroxide) and some aroma, although many betel chewers also use tobacco. Betel chewing has very long tradition in Burma, having been practised since before the beginning of recorded history. Until the 1960s, both men and women loved it and every household used to have a special lacquerware box for paan, called kun-it, which would be offered to any visitor together with cheroots to smoke and green tea to drink. The leaves are kept inside the bottom of the box, which looks like a small hat box, but with a top tray for small tins, silver in well-to-do homes, of various other ingredients such as the betel nuts, slaked lime, cutch, anise seed and a nut cutter. The sweet form (acho) is popular with the young, but grownups tend to prefer it with cardamom, cloves and tobacco. Spittoons, therefore, are still ubiquitous, and signs saying "No paan-spitting" are commonplace, as it makes a messy red splodge on floors and walls; many people display betel-stained teeth from the habit. Paan stalls and kiosks used to be run mainly by people of Indian origin in towns and cities. Smokers who want to kick the habit would also use betel nut to wean themselves off tobacco. 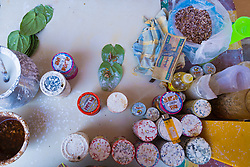 An anecdotal government survey indicated that 40% of men and 20% of women in Myanmar chew betel. An aggregate study of cancer registries (2002 to 2007) at the Yangon and Mandalay General Hospitals, the largest hospitals in the country, found that oral cancer was the 6th most common cancer among males, and 10th among females. Of these oral carcinoma patients, 36% were regular betel quid chewers. University of Dental Medicine, Yangon records from 1985 to 1988 showed that 58.6% of oral carcinoma patients were regular betel chewers. Since the 1990s, betel chewing has been actively discouraged by successive governments, from the State Law and Order Restoration Council (SLORC) onward, on the grounds of health and tidiness. In April 1995, the Yangon City Development Committee banned betel in Yangon (Rangoon), in anticipation of Visit Myanmar Year 1996, a massive effort to promote the country as a tourist destination. Effective 29 July 2007, betel chewing, along with smoking, has been banned from the Shwedagon Pagoda, the country's most important religious site.